The Office of the Chancellor and the Division of Diversity, Equity and Inclusion invite nominations to recognize an outstanding faculty member for this teaching award. IUPUI is committed to preparing the next generation of culturally competent, global citizens who value diversity both within and across cultures. Multicultural teaching is recognized as a principal strategy through which the campus' vision, mission and goals related to diversity are realized. The Chancellor's Award for Excellence in Multicultural Teaching acknowledges faculty who integrate culturally relevant content into their curriculum, who employ an inclusive, student-centered pedagogy, and who champion diversity as a value that ensures the academic success of all students. 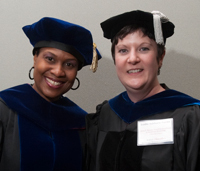 Jennifer Thorington-Springer, Associate Professor of English. 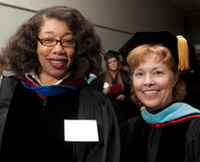 She is an individual recipient of the 2010 Joseph T. Taylor Excellence in Diversity award, as well as a member of the Multicultural Teaching Community of Practice, the program recipient of the 2011 Taylor award. Dr. Thorington-Springer has been called "one of this institution's strongest advocates for excellence in diversity. Robin Hughes, Assistant Professor in HESA. Her research has focused on race, and how those issues might impact faculty and students of color in higher ed. She is a frequent contributor to "The Diverse Blog," an online companion to the magazine "Diverse: Issues in Higher Education." Her research also deals with the development of students who are athletes participating in revenue generating sports. Hughes co-founded and co-edits the Journal for the Study of Sports and Athletes in Education.